The 2019 Festival is a bold exploration of law, redemption, and unlikely friendships in a divided world, spotlights works that are accessible to newcomers but will also thrill lifelong opera fans. 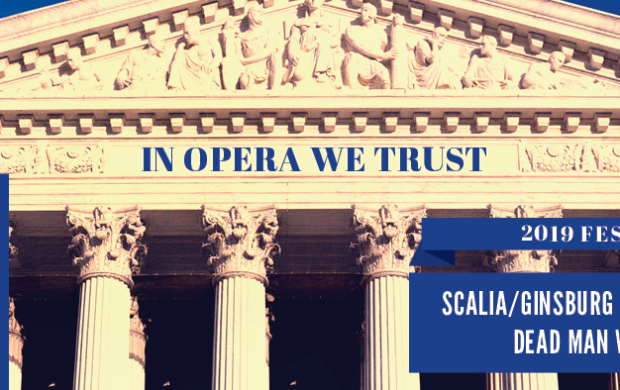 On the docket: a delightful double bill of SCALIA/GINSBURG (composer Derrick Wang's one-act opera about the friendship between Justices Ruth Bader Ginsburg and Antonin Scalia) paired with TRIAL BY JURY (Gilbert & Sullivan's beloved courtroom comedy). We will also present one of the most successful contemporary operas of our time, Jake Heggie’s DEAD MAN WALKING . Based on the book by Sister Helen Prejean with a libretto by Terrence McNally, this modern masterpiece about a death row inmate and the nun who becomes his reluctant spiritual adviser is unlike anything we’ve presented in our history.